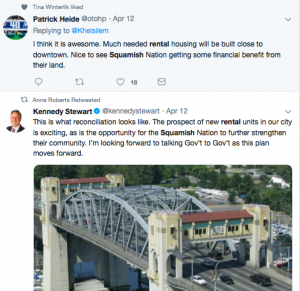 The reaction on often-toxic Twitter was very positive, with people (at least in my stream) very excited about the thought of a lot of new housing in an area where there’s a huge demand, as well as the news that the Squamish are seriously considering making the units all rental. I’d advise people not to break open the champagne just yet, as some members apparently are arguing in favour of the early money that some condo development would provide. As well, no one is saying what prices the units might rent for yet. Some people are also dubious about the idea of having Westbank/Ian Gillespie as the partner, given his penchant lately (Vancouver House, Butterfly, Oakridge, Kengo Kuma tower) to build for the ultra high end. He did do the Woodward’s building, granted, with its two social-housing components, but that’s quite different from trying to figure out a market approach to providing affordable rental. CHMC people sound very excited by the project and say there’s money available (cheap financing, etc.) if the Squamish do decide to make some or all of it lower-cost. In the meantime, the really interesting story behind all this is how the Squamish were slowly pushed off their land, which was a permanent settlement, not just a summer camp for them. This timeline from UBC provides some excellent information and mapping of what happened over time. APRIL 12: The Squamish Nation’s plan to build a massive housing development in the heart of Vancouver is getting the enthusiastic backing of the mayor, even though the city will have little say over how construction proceeds. The project, which the Squamish have said they hope can begin within five years, will introduce the first high-rises that have been built in Vancouver’s historic Kitsilano neighbourhood, where protests against developers and density in the 1970s prompted a new city council to bar high-rise buildings. The neighbourhood has been unenthusiastic about even milder forms of density, with residents protesting against two current proposals for low-rise apartments. Vancouver has no direct control over what happens, since the land is owned by the 4,000-member Squamish Nation and is not subject to any city zoning or bylaws. The Squamish don’t even need to make formal applications to the city. The potentially 3,000-unit project on a strip of land just across the water from the city’s downtown will be a partnership between the Squamish and Ian Gillespie of Westbank Developments, one of the most prominent developers in Vancouver, sources close to the proceedings told The Globe and Mail. Mr. Gillespie did not comment. The development will be built on the remaining chunk of land the Squamish were left with from what was once a permanent settlement called Senakw. White settlers referred to the land as Kitsilano Reserve 6. The land size was gradually reduced, and the last residents were forced to move to the North Shore in 1913. Each family got $11,250 for the move. In an interview earlier this week, Squamish council member Khelsilem said his nation sees the development as “the beginning of a new era” and a chance to create a new narrative about Senakw. On a practical level, the project will benefit Vancouver, while providing Squamish members with funds for social services, including housing, said Khelsilem, who uses only one name. He said that process, expected later this year, will allow for more disclosure on specifics around the project, including initial concepts and density. The Squamish development will sit on the eastern boundary of a prominent and popular park in Vancouver and will likely require several high-rise buildings to accommodate the density, although no preliminary plans have yet been done with those kinds of details. That could block some views views looking east. The Squamish would not legally be required to abide by any city restrictions on blocking views. Mr. Stewart had no comment on the density, saying he hasn’t seen a formal plan yet. Larry Benge, co-chair of the West Kitsilano Residents Association, said it was a challenge to respond to the proposed development because of a lack of details. Mr. Benge, who said his only information on the project had come from media reports, said he was concerned about how so many new residents would fit into the area. He also said he was curious about how affordable the rent for the new units will be. Asked about concerns expressed by Mr. Benge about additional details and consultation, Khelsilem said the priority of the Squamish Nation administration is to seek consent from their own members. He noted that the land is under the authority of the Squamish Nation so the city has no authority over it in terms of zoning and bylaws. However, he said the concept of making the project work in the context of surrounding neighborhoods, and city infrastructure, transportation and amenities is a necessary conversation. Still, he noted that the project helps deal with city needs around affordable rental units. The mayor has been heavily promoting the city’s desire to create more rentals, but neighbourhood opposition has already come from Kitsilano to new apartment projects being developed under a new rental-incentive program. The mayor said he’s had a couple of informal talks with the Squamish about the development, and his council will get together with the nation’s council for a dinner on Monday, a meeting intended as a getting-to-know-you event, not a land negotiation. The Squamish are among the most entrepreneurial and business-focused nations in the province. It owns the land the Park Royal shopping mall sits on and collects rent from the operator. 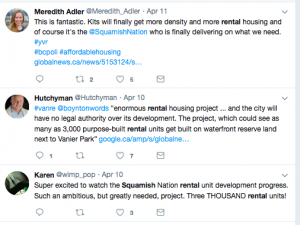 For the Vancouver project, Squamish councillor Khelselim has said the nation is seriously considering making all the units rentals, although a final decision hasn’t been made. If that were the case, the project would add almost the same amount of rental housing to Vancouver as the city has been able to get from developers in the past five years using incentives. Mr. Gillespie has been involved in some unique projects throughout the city, notably Woodward’s, where he incorporated two social-housing buildings with market condos and retail, office and university space in the former downtown department store. But he has also become controversial as Vancouver’s real-estate market turned ugly the past few years, because of his high-end projects that he markets in Asia. The Squamish nation is planning to hold a referendum on the deal.